Land reform begun in Zimbabwe in 2000 was supposed to redistribute land from predominantly white-owned commercial farms to much poorer black farmers who toiled on communal lands. Proponents argued that the redistribution was necessary because commercial farms occupied the most fertile lands, leaving only dry, dusty land for communal use. This rationale reflects confusion about cause and effect regarding land ownership and land quality. 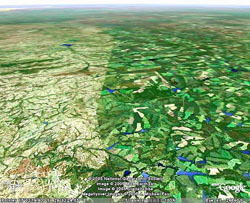 In the "Before" photo below, the dry communal lands on the left are sharply delineated from the green private farms dotted with lakes and ponds on the right--so sharply that soil quality and rainfall are unlikely to explain the difference. Now click the arrow to see what happened after land reform. The dams and irrigation systems on the private farms collapsed, making them look more like communal lands, to the detriment of all. Zimbabwe is one of Sub-Saharan Africa's bleakest cases. Under an increasingly oppressive regime led by Robert Mugabe since 1980, Zimbabwe has been marked by massive human displacement, run-away inflation, and a plummeting economy. 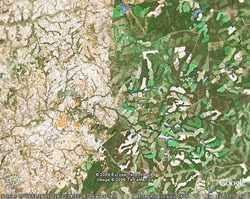 The before and after satellite photos were prepared by Craig J. Richardson, a Salem College economist, using Google Earth, a powerful new software tool that pools images from various satellite imaging companies. 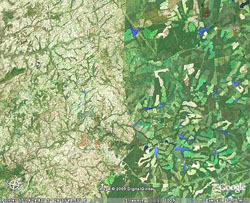 The photos presented were taken over the province of Mashonaland West, which has some of Zimbabwe's richest soil. The photos provide graphic new evidence of the environmental, economic and social costs of ill-conceived land reform. The photos are presented as part of a Center for Global Development initiative: Zimbabwe: Crisis and Future which provides analysis of the economic conditions and proposes ways for the international community to think about its supporting role in the upcoming transition to a post-Mugabe Zimbabwe. The three commentaries below explore such topics as how land tenure has affected land use patterns, how the revocation of property rights impacted agricultural productivity, and what these changes mean for Zimbabwe's future. 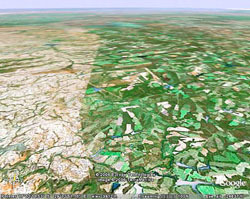 Anyone flying over Zimbabwe on a clear day in the year 2000 would have seen huge differences in the farming regions, and perhaps better understood the country's longstanding issue with land reform. These dramatic photos reveal two different tragedies of land in Zimbabwe, both of which will have to be addressed if the country is going to recover and prosper in the future. When I first saw these photos, I found them scary. They represented my worst nightmare of how badly a country can shoot itself in the foot while trying to traverse what is always a difficult development path.